Over Christmas we drank quite a bit of Cava and quite a lot of Nordguld Aquavit and Kell came up with the idea of combining the two and it make s a pretty delicious cocktail. Chill Champagne glasses in the fridge or by swilling around a couple of crushed ice cubes and drying quickly. Soak the sugar cubes (one per glass) in a few drops of Angostura Bitters and drop in to the Champagne glass. Pour in 15ml Nordguld Aquavit. Top with Champagne and serve immediately. Aalborg Nordguld is a very special aquavit with a unique taste. 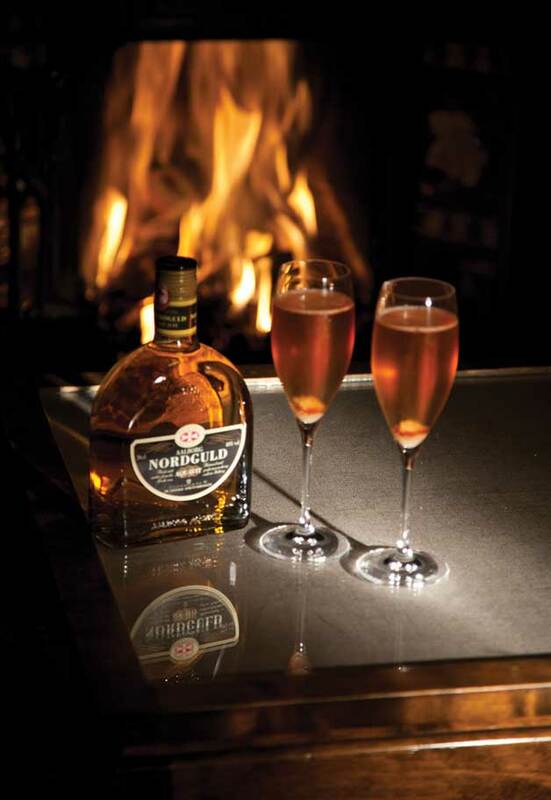 It is the world’s only aquavit distilled with amber – the Gold of the North. The amber oils used during distilling give body, a touch of resin and pine and a hint of citrus to the taste. In addition to this, Aalborg Nordguld is made from classic aquavit spices and fennel and is then matured in Spanish sherry casks to get its smooth and harmonious finish.